I was living in L.A. in the summer of 2013, when we first started putting this issue together. Pacific Rim was really big. Her was being born, #normcore still in the womb. George Saunders, though popular, was yet to be published on the broadside of a brown paperbag at Chipotle. Someone mistook me for Bradley Cooper, his face plastered across bus stops and billboards in the wake of Hangover III. I ate fajitas at El Coyote with a FOX agent who said she was dating (the new) Captain Kirk. Paramount had recently released J.J. Abrams’ Star Trek Into Darkness, which would go on to gross over 400 million dollars worldwide. Though I don’t remember any major L.A. fires, Tinder was very much a thing, and Hollywood felt the way it always seems to feel: aflame, particularized, everywhere in the air. The conceit of this issue is, I guess, to breathe that air in. Phil Solomon was the first filmmaker we reached out to. I asked if he’d write something and explained our concept: to critically engage the so-called mainstream cinema – big and little screens and scripts, their widespread consequences and cultural derivatives – to survey this Blockbuster experience from the perspective of a supposedly more “experimental” media community. I sent along our Call for Submissions, did some Qi Gong on a friend's Mt. Washington farm, and then went out onto York Boulevard and bought a book, Where Art Belongs, by L.A.’s meme art critic and Semiotext(e) best-seller, Chris Kraus. Perhaps another time, another issue, another topic. Haven't got the energy or the urgency needed to deal with this subject, on which all I have to say is negative – and I may post something on Facebook if and when the (negative) spirit moves me enough that I need to articulately vent and rage against it all. All I see everywhere these days on my rare visits to the cinema, in every insufferable trailer (and it seems like the parade of them never ends) for every forthcoming “blockbuster” are the constant national regurgitations of post-9/11 skyscrapers-falling-down-upon-the-running-and-screaming-populous and then crumbling into a grey powdered, post-apocalyptic dustbowl vision in 3-D IMAX (flying debree is always the most beautiful thing in 3-D) with 9.1 speakered bonecrunching sound cranked at full tilt until you are pummeled into some kind of submission, cinema as crunch time – is this constant replay of our 9/11 PTSD some kind of ongoing national catharsis? Will it never end – until we simply will have no other choice than upping the ante and the kicks in the "real life" multi-player game again? Disgusting. And doesn't interest me to think any more about it than that. My “block” has been “busted” enough, and I’m comic-superhero’d and apocalypse-now’d to death. When the topic is more about the cinema of quietude and exquisite subtlety and I can write about work that I love, please feel free to send me another one of these requests. Solomon’s declension articulates, I think, the bind of the Blockbuster. Even when we don’t want to address the megaplex, we already have. We can’t really look away. We live in ever-more intimate proximity to impersonal fame and distant celebrity. Los Angeles doesn’t just play itself, as Thom Andersen said in 2003, today the city asserts itself: it is popular, atomized, and always in dispersal. 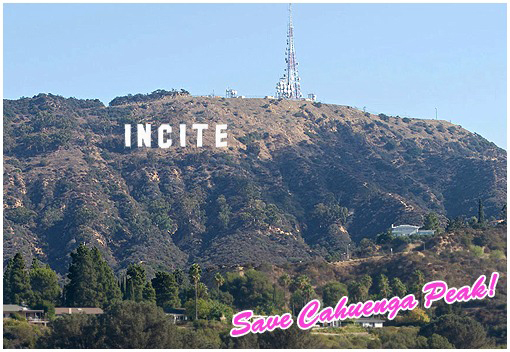 And now it’s in INCITE too – though even in absence, the presence of Hollywood was here all along. Many of the projects in this issue address Kraus’ question. Some don’t. Some address related things, like Los Angeles’ imagistic offspring, a specific Blockbuster, or many. Some examine Hollywood’s theatrical and everyday audiences. And so on. Because the content is diverse, we’ve organized it into sections, which loosely trace these experiences onscreen and online, dispersed IRL, and embodied in our heads and in our hands; in, in, in. Breathe it in. I left L.A. at the end of last summer. A few months later, National Geographic ran a story about mountain lions living in Griffith Park. A “trend forecaster” collective called K-HOLE released a “report” declaring “we live in Mass Indie times,” inspiring a New York Magazine story on “embracing sameness” in lieu of “striving for ‘difference’ or ‘authenticity.’” The Hobbit (Part 2) did about as well as expected. Former web series Broad City debuted on Comedy Central. Game of Thrones entered Season 4. Lena Dunham posted photos of her dog on Instagram. George Strait retired. Another Whitney happened. (Semiotext(e) was in it.) We made this issue. Lots of stuff happened. I went back to Los Angeles. A good place to find a mountain lion is, according to Nat Geo, around the Hollywood Sign. Even if it’s hot. Even if you have to wind your car around Los Feliz for an hour before you finally find the dirt road entrance, because even the iPhone, it turns out, is often limited when it comes to directions. Use an atlas. You get out in the sun and you apply, if you do, a ton of SPF. You walk for an hour or two, up and down hills, alongside people from all over the world, cameras drawn and some even on horseback. You talk to your friend about how you can’t believe you’re actually walking to the Sign. You don’t see a lion because it’s nearly impossible to see one – the guy from Nat Geo spent dozens of hours sitting in a blind, waiting. But you do see the flat valley and the distant ocean and the panoramic skyline. You inhale the smog. You can't help but let it in. You hear some ravens in the air above Mount Lee and see the rooftops of West Hollywood on the horizon. You feel that the city has infiltrated your body, altered your voice. You feel great, on top of the world, like some future version of yourself in a moment of internet famedom. You feel part of something immense and important: “We are here, it is dusk, this moviescape is beautiful and we like each other so much!” You stand before the Sign, forever facing west, and maybe you see a hawk, as I did, perched and stoic atop the giant letter L... right next to the giant letter Y.
Peter Nowogrodzki is an editor at Fence and a regular contributor to INCITE.